What is a video frame? This timecode calculator (or TC calculator for short) helps you convert frames to timecode in a recorded video. Thanks to this tool, you will be able to quickly identify the correct frame, or check how long your video will be. 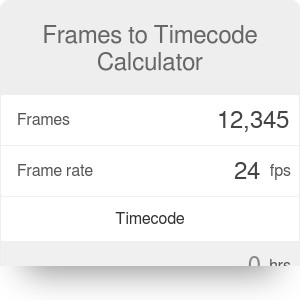 If you'd like to convert a timecode to frames, check out the timecode to frames calculator. Each video consists of a number of still images, called video frames. Shown in a sequence, they create the illusion of a moving image. Each of them is shown on the screen for a very short time, for example, for 1/24 of a second. The number of frames shown per second, also called fps or frame rate, varies depending on the video. For instance, most regular movies use 24 fps, but this number can be as low as 12 fps (in case of animated movies) or as high as 60 fps. Timecode is a sequence of numbers that describe a particular frame in the video. It is usually used in video production by camera assistants, who mark the beginning and end of a scene. For example, consider the timecode 00:04:15:13. It describes a frame that will be shown within 4 minutes, 15 seconds and 13 frames from the beginning of the video. Using this timecode calculator is extremely simple. All you need to do is input the number of frames and determine the frame rate of your video. 00:00:20:00 for 50 frames per second. If you liked this timecode calculator, make sure to check out the time lapse calculator, too! Frames to Timecode Calculator can be embedded on your website to enrich the content you wrote and make it easier for your visitors to understand your message.